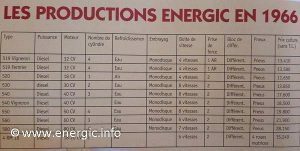 During the second world war the Energic factory at Villefranche-Sur-Saône (dept. 69) was taken over by the Germans for the production of armaments in particular ammunition. Having spoken to relatives of the founder Albert Patissier, even though they where tasked to produce these weapon in war none where effectively produced as the engineering equipment in the factory was the wrong type and caliber to produce ammunition. Actually the work force made it that way, not adding to any additional weapons available to the Germans in occupation. 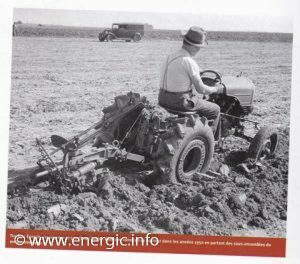 After the war encouraged by the Monnet and Marshall plan (To re equip French agriculture quickly with cost effective tractors, motoculteurs and agricultural equipment made in France and supplemented initially with american imports). Patissier initially started it production with its new motoculteurs and now Tractors (for small farms/polyculture maraichère, and viticulture/vignoble). In 1945 early 1946 there where still significant parts for the B5, C7, D9 and type R ranges. So Patissier made up a number of motoculteurs from these parts and sold them. I know this as I recently acquired a 1945 Energic D9, that had been in the same family since new! This model, was available in the late 1930’s (from 1937 on wards). It was ahead of its time and offered Patissier ground breaking engineering, compact and efficient 2 stroke engines. It was re-manufactured after the second world war as part of the starting line up of Motoculturers available from Ets. Patissier. Interestingly I have a 409 manual dated and printed “May 1945“. The first new model manufactured was the 407/409 (500cc), which was of a complete in house design and manufacture. 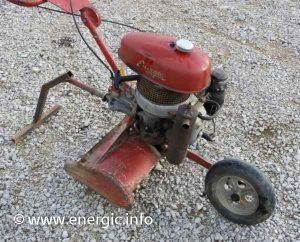 The first time Energic had manufactured its own engines as well as the chassis etc. A big step forward for efficiency of production, costs etc. As well as the engine being a great step forward the integration of all the component parts for the wheel clutches over came a great problem in the C7 and D9 ranges before the war. That of the ingress of mud, dirt etc, eroding the wheel hubs, clutch movement pins and general wear. Placing these parts internally ment they could be adequately lubricated and protected for the wear and tear of active duty. 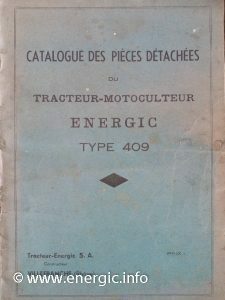 Energic 409 Motoculteur available from 1946 May/Mai. 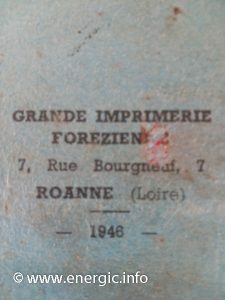 And a “catalogue des piéces détachées” dated 1946. 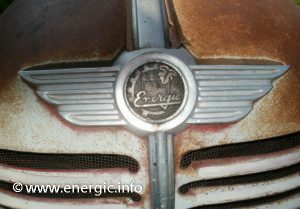 This very early Energic 409 motoculteur model had a open trap door on top of the hood for access, in the initial design. This was dropped in later models as the 409 evolved. Mr Patissier had looked at the overall design, and had incorporated the strength and structures of the tractors of that time. With a strong chassis, engine and versatile multi disc oil bath clutch this Energic motoculteur was the basis of all to follow. There where also numerous engineering solutions and innovations on these early machines, overcoming some of the fundamental problems inherent in the early B5, C7 and D9 machines. 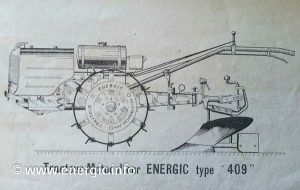 Energic motoculteur 409 early model. 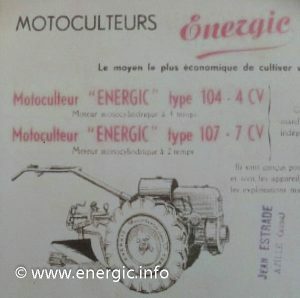 In late 1947/8 Ets Patissier was developing and testing a small tractor prototype using the engines of the 500cc motoculteur 409 @ 9cv moteur from the motoculteur 409. 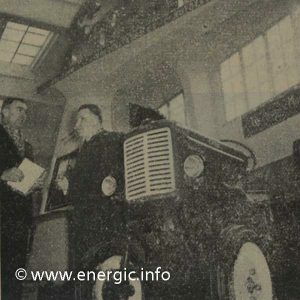 The Energic tracteur 509 model at 9cv was the first to be developed it was in production in late 1948.This was the first major departure from the previous 18+ years core business of just motoculteurs manufacture.This Energic tracteur was aimed at Ets Patissiers core market place of small farms/polyculture – maraichère, and viticulture/vignoble. Energic prospectus 1948/9 very rare. 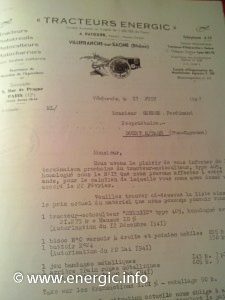 Also at this time Ets Patissier was manufacturing and re-manufacturing parts of the motocycle, auto/cars, avaiation industries as well as offering his specialist services/workshops for the manufacture of general mechanics. As having the skilled wor force, milling, lathes, presses, and heavy metal working machinery enabled him to work within these associate sectors. This would change as Ets Patissier core business grew. Later toward 1949/50 the larger moteur Motoculteur 411 was developed and was a instant hit. The more powerful 411 11cv Patissier moteur proving to be the most effective and efficient combination for the new 511 tracteur. The 509 tracteur was dropped in favour of its larger moteured brother in 1950. 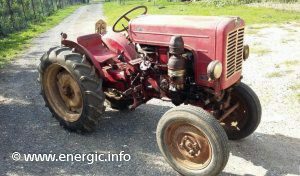 There was a high demand for this economic, fuel efficient smaller tractors – that the small farms/polyculture maraichère, and viticulture/vignoble, small holders could work and afford. Especially in the areas that Ets patissier had historically supplied with the previous pioneering generation of motoculteurs B, C7, D9 and G types. 1950 Range; Motoculteurs; R 7, 409, 411. Tracteurs; 511. 1951/2 the 100 series started with just 2 models the 104 range was added, with the Bernard W110 4 temps, 4cv engine introduced late 1951. And the 107 taking the R7 7cv 2 temp moteur. 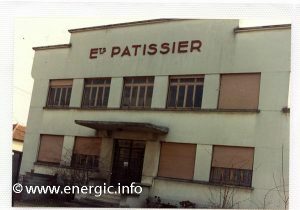 By mid 1952 Ets Patissier was employing 300 people, in a factory of 32 000m2 (9000m2 covered), producing 200+ machines per month, approx. 16 000 machines produced since 1930. 4/1954 The new 200 series continued using the Bernard W110 4 temps, 4cv engine (available from 1951) in the 204 model and the Patissier engine 2 temps, 7cv (available pre war in the R7 then 107) in the 207 model. 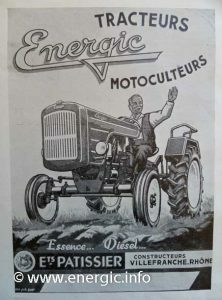 Also Ets Patissier now looked at supplementing its own engined range of tractors with a larger version the Energic 518 petrol (based on the 203 engine available from 1948) in 1952, at 18cv and the 625 25/30cv diesel possibly with a Cérès engine (Cérès engines are later found in the 525 series one with the p-25 from 1958). 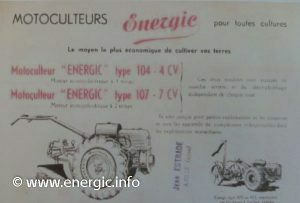 There was a demand for a more economical diesel version of the popular Energic 511 and in April 1954/55 when the type 1 was updated, and the newer bodied type 2 was introduced, Ets Patissier included a 604cm3 Scahs diesel version of the 511…… the 512. 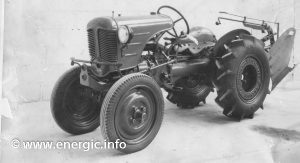 The range of motoculteurs was also increased to utilize the economic and popular Sachs diesel engines, with the 412 air cooled and the 410 using a smaller 10cv 500cm3 engine (water cooled).This smaller Sachs engine also powered the new 510 tractor. So we can see the new line up of Motoculteurs and Tractors reflecting demand. But with Patissiers ingenuity using a small no of engines, some in house, which where common across the range saving on cost, development and concentrating production and machinery. On this basis the Mototracteur 712 range (1955) was introduced using the 411/511 11cv petrol engine and the diesel version using the 412/512 12cv engine. The Mototracteur was a departure from 2 to 4 wheels, driven by the front 2 as in the 411 motoculteur, but articulated/hinged in the middle with a trailing equipment rack or hitch system. 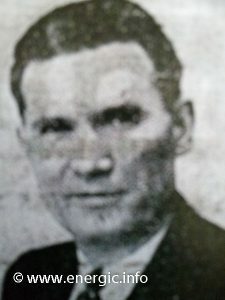 1955 approx. 20000 machines S.A. capital de 55,000,000 de fr. 25 years of trading. 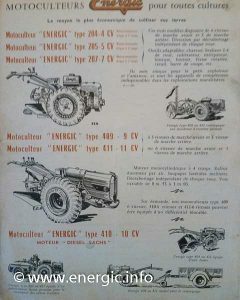 Energic tracteur 500 series range 1955. Range consisted of; Motoculteurs 204, 207, 409, 410,411, Tractors 510,511, 512, 518 18/22 (Peugeot 203), 519 (Peugeot 403) 19/26cv petrol. The New Mototracteur range was introduced comprising of the 712 Patissier petrol 11cv and the 712 diesel Sachs engine 12/14cv. 1957 range 5 motoculteurs petrol, 4 5, 7, 9, 11.cv. + 10cv diesel. Mototractor essence 11cv, 3 tractors diesel 10, 12, and 18cv. 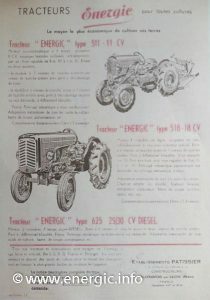 2 tractors essence 11 and 18/25cv. Also a 519 tmd diesel. (Models 512 diesel and the 519 petrol and diesel where the most popular with the buying public at the Foire de Lyon in 1957). Energic agricole show 1958 with Mr A Patissier presenting on the stand. 1959 range; Motoculteurs; 204, 205, 207,409, 410, 411, and 412. Mototracteurs; 712, 11 cv petrol and 10 and 12cv diesel. Tracteurs; 510, 511, 512, 518 petrol (18/25cv) and 519 diesel (25/28). 15 models ranging from 4cc to 25/28cv, 25 000 machines produced since 1930. 1959 Bernard moteur W610 used in 206. 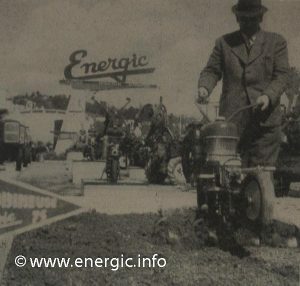 Energic range 1962 at a large Rhone agricultural fair. 1/02/1963 Motoculteur model range; Motoculteurs (2cv to 12cv); of this period consisted Type 75 rapide (motobineuse), 102 2 cv monoroue, 103 3.5 cv, 110/114, 210 series models 214, 215, 216 and 217, 409, 410, 411, 412. 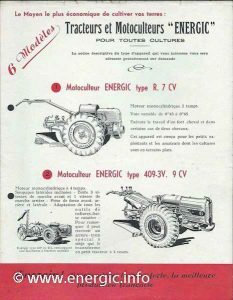 1/02/1963 Tractors model range (10cv to 25cv); of this period consisted, 510, 511, 512, 712, 519 petrol (203 18/25cv and 403 20/25cv engined) and 519 diesel, and the type 1 Cérès engined 525 25/30cv. Mototractors 711 11cv petrol and 712 12cv diesel. 3/1963 saw the introduction of; the 220 range, 519 indenor dp 85, (203 petrol moteur 519 ended), 4RM 12, 4RM 18, motobineuses 100cli, 75 cl, 100 cl, MVL 100. 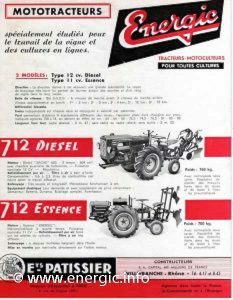 1965 (28/02/1965 exactly) saw the enlargement of the tracteur 500 series range to include a new partnership with the Austrian manufacturer Steyr. Under this agreement Steyr tractors where re badged Energic and supplied to dealership. The range consisted of 6 models (520, 530, 540, 550, 560 and 580) starting with the diminutive 520 18cv to the large 78.5cv type 580. This was a clever move by Mr Patissier, as he could present a credible range of tractors, that where tried and tested from a large high quality manufacturer, to the French domestic market without the huge costs of research and development, factory re tooling etc. 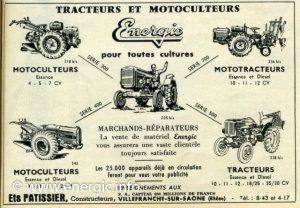 Model range of tractors Energic from 28/02/1965 consisted of Tractors Austrian tractor manufacturer Steyr re badged “Energic.” Range 530, 40, 50, 60 & 80 . The model year was 1966 and they where available from the dealers from 1/05/1965. (see below). 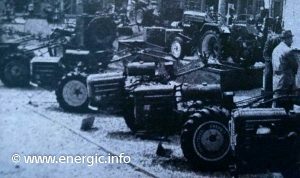 Energic Tracteur range production in 1966. 1970’s to early 80’s ranges included Tondeuses, Motofoucheuses, Motobineuses, Motoculteurs, Tracteurs, Enjambeurs. From 2.5cv to 78.5cv. –Type 75 MVR, Type 77, Type 100 MVLK and 100 MM, Type 120, Series 220 — 224/225/226/227/228, Series 400 — 409/410DA/411/412, Series 4RM — 4RM-12/14- 4RM-18/22- 4RM-28, Series 500 511/512, Type 519 (second generation) 32cv Diesel, Type 521, Tracteurs Steyr rebadged 530/540/560/580. The range also included; Lawn mowers/Tondeuses 5 types; Primevere 2.5cv 2 temps, Eglatine 4 temps 3.5cv, Pervenche 2 temps 2.5cv, Jacinthe 3.5cv 4temps and Orchidee 4cv 4 temps. Rotivators/Motobineuses type L 70 3.5cv B&S moteur, 75 rapide, Rubis, L 77 and RAM 4 & 6. To capture a larger market as competition from Japan etc., increased. 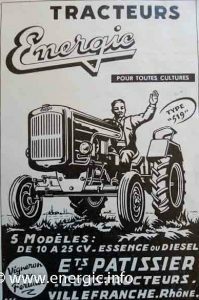 A decision was made to stop producing motoculteurs tractors in that period, and concentrated on sourcing and re-manufacturing motoculteur/tractor body parts and spares for existing and previous product ranges. Ets Patissier also continued to manufacture the popular smaller motobineuse range, with annual sales of just 2000 machines. 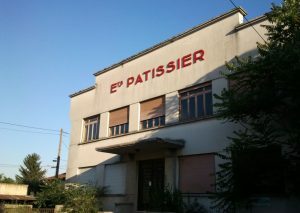 It was inevitable that this decline in production and subsequent reduction in sales and revenue made Ets Patissier vulnerable to the much larger mass production competition. 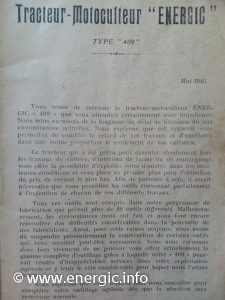 Mr Albert.Patissier lodged and held over 40 French patents and 18 international patents in Tractors and Motoculteurs, Motobineuse and other associated mechanical products. A great innovator, engineer and business man of his time. Energic factory as in 2015. 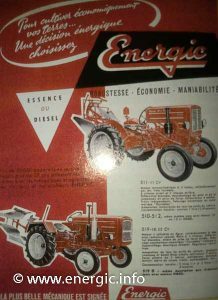 Read more about the Energic Tracteur 511 mark 1 here. 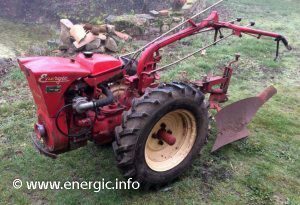 Read more about the Energic Tracteur 510 here. Read more about the Mototracteur 712 petrol/essence here.